The filling is basically cheesy mashed potatoes, with some other ingredients mixed in. But the presentation can be nice enough to make people think you spent a long time making them. I used square wonton wrappers because that's what they had at my store, but round ones would be the more traditional shape. I was a big fan of how crunchy they were on the edges with the nice soft contrast of the filling. I also purchased sour cream with chives already mixed in, because I sure enough never figure out something to do with the rest of the fresh chives before they go bad. I'm planning on using the rest of the premixed sour cream and chives in baked potatoes and maybe a dip for chips. 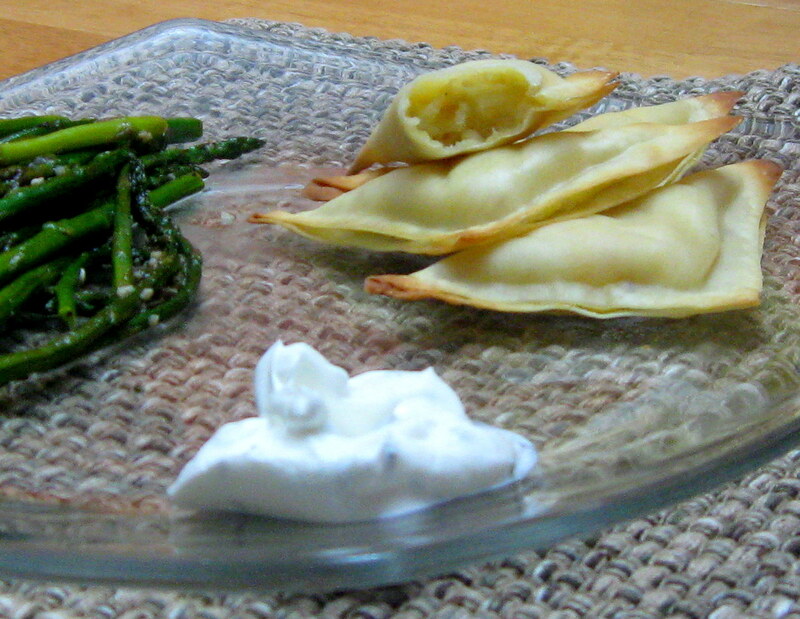 As you can see from the pictures I served the dumplings with asparagus and just the sour cream "dip" and it was actually plenty. For me they were more of a main dish but you could also serve them with meatloaf or chicken and have the dumplings be a side dish. I'm a pretty big fan of side dished that end up as main dishes :). I also like individual servings of foods (especially desserts), but that's a completely different story. So, if you're looking for a way to use up those wonton wrappers or a quick and easy weeknight dinner, give it a whirl and let me know what you think! 1. Preheat the oven to 350F. In a medium saucepan cover the potato with water and cook over high heat until the potato is tender, 8-10 minutes. Drain the water from the pan and add the cooked potato to a medium bowl. 2. Add the garlic, cheese, 3 T. sour cream, salt, and pepper. Mash the mixture together until well blended, but do not overmix or the potatoes might become gummy. 3. Lay out the wonton wrappers individually and divide up the potato mixture in the center of the wrappers, use about ¾ T. - 1 T. filling for each. Using your finger or a pastry brush, brush water along the edges of the wrapper on one side. Fold the wrapper over the filling and gently press the edges together. Place the dumplings on a cooling rack on a cookie sheet. Lightly spray both sides of the dumplings with cooking spray, then bake for 15-17 minutes, until golden brown. 4. 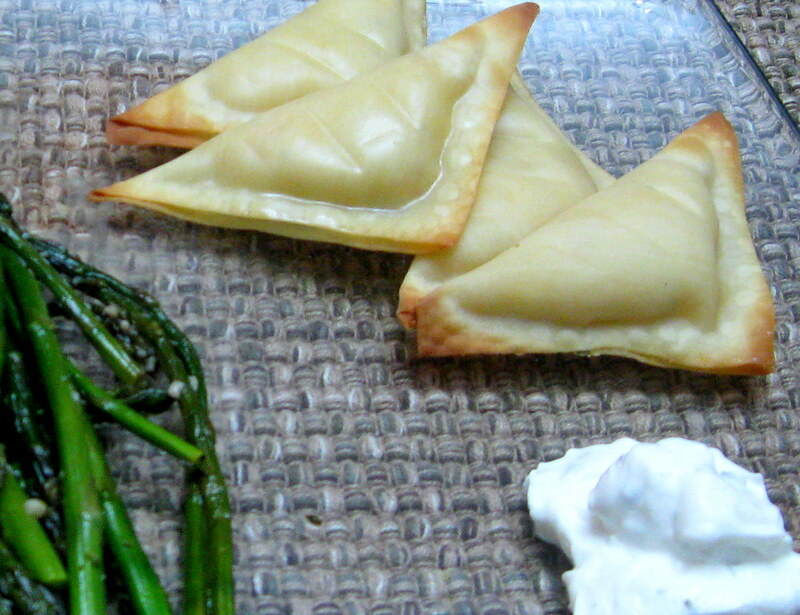 Serve the dumplings with the remaining sour cream, for dipping. Have wrappers leftover from making mini crab rangoons. SO making these for lunch tomorrow! BTW, M asked if G was coming over for pie. We made 10 and she (totally out of the blue) said he should take one home! The wonton wrappers are a great idea. Thanks for sharing it. So much faster than making perogie dough.